1. Do I get charged for not cancelling a marina reservation? 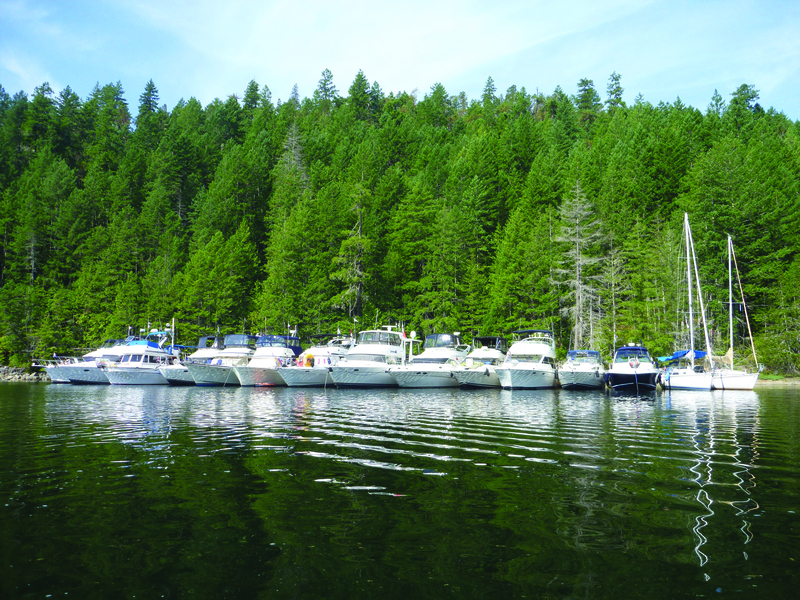 Most Marinas understand that poor weather or mechanical breakdowns can interfere with plans. Marinas do expect to be notified immediately if your plans change and most do not charge for not showing. Some marinas maintain a record of NO SHOWs though, which might be slightly embarrassing the next time to want to reserve a slip. When travelling with a group, marinas expect the cruise director to manage the group booking and provide a full list of vessels, name, length and duration of stay in order to plan for assigning slips together in the marina. 2. What is the fender and tying etiquette for rafting in an anchorage? The first vessel will set their anchor and tie a stern line to shore before accepting other vessels. Incoming vessels should contact the raft master for instructions. When instructed to come in to join the raft, you may be asked to drop an anchor and back into the port or starboard side of the raft. The incoming vessel will be instructed which side to join the raft. The incoming vessel should set 3 fenders AT THE RUB RAIL and 3 long lines (15-25′) on the side she is joining. The captain or admiral should eye ball the height of the two vessels rub rails to be certain the fenders will adequately protect each vessel. The joining vessel always throws/using their lines to tie. In most cases the mid ship line should be thrown first and wrapped on a mid ship cleat to help bring her in (unless of course you are Popeye). The stern then bow lines follow and the stern line is tied/locked first to align the swim grids before tying the mid ship and bow. Caution – the larger the vessel, the larger the fenders you need to protect her. Wind and waves or wakes can cause considerable movement in a raft up. When setting fenders – check for windows or exhaust/drain outlets on the hull of both vessels to avoiding blocking them. Always offer to assist another vessel with catching a line. If you are going to purchase a stern line, 600′ of brightly colored floating line is recommended. One never can be sure how far up the shore one has to climb to round the closest tree. 3. What is the rafting etiquette without a stern tie? Ask the anchored vessel if you can raft. Typically no more than three vessels can raft on one anchor which would be the center vessel. Under no circumstances should more than one anchor be set as the raft will spin on the tide or wind. 4. Is it okay to cross other vessels in a raft? Absolutely. In fact the best etiquette is to ask for permission to cross the first time you board another vessel and also to make an effort to cross the entire raft to greet your fellow boaters provided you are able to do so. 5. Can I pull out of a raft if I am in the middle? Yes you can but it requires some effort and planning. If you know you will be leaving early, its best to not have a main stern line or anchor set. Ideally you would try to be on the outside of the raft in order to peel off. This is not always possible because the smaller boats (now referred to as the fast boats) are toward the outside ends of the raft. Nothing is impossible though and it is not a hard and fast rule that you are stuck until the raft breaks up. 6. Is there any privacy in a raft? Yes but this is usually inside your own boat. Rafting is a very social gathering so if you are travelling with the group and prefer your privacy, no one would be offended if you prefer to anchor near by and visit by dinghy. Excerpted from Port Moody Power and Sail Squadron. Tips and Etiquette for Cruising by Dave and Kim Edgar: http://www.cps-ecp.ca/portmoody/Uploads/-234Frequently-Ask-Questions.pdf. The entire list is worth checking out. Port Moody are the raft–up kings and queens! They have it down pat… seeing them tie up at Union Steamship Marina on Bowen Island is most impressive. What nice thing to say Burnaby, thanks!! !